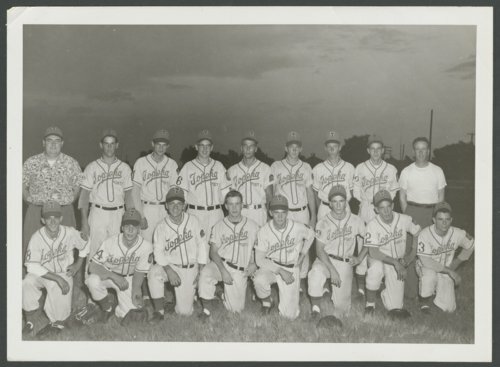 The photograph shown here features the Topeka Mosby-Mack baseball team that won the state American Legion championship in 1952. Also shown is a presentation binder and certificate issued to one of the players, Ted Worthington, certifying that he was a member of the championship team. The team represented Topeka's Capitol Post 1 in the Legion baseball program, but got its name from its sponsor, the Mosby-Mack Ford dealership. The Mosby-Macks won the state title by defeating Pittsburg, 11-1, in the championship game played in Russell. Pictured in the top row of the photograph are (l to r): Bob Perry (coach), Larry Ward, Carl Ward, Galen Mote, Lyle Kraemer, Don Luttrell, Ford Arbogast, Ted Worthington, and Cliff Fawl (manager). Kneeling in front are (l to r): Vern Buschbom, Ray Stockwell, Jimmy Griffith, Earl Graham, Don Dixon, Ed Graham, Jim Golden, and Ralph Luce. The owner of the certificate, Ted Worthington (then of rural Lecompton and later of Tecumseh), was a left-handed pitcher on the team; he was the winning pitcher of record in three state tournament games, two of which he entered in relief. One of the team's members, Jim Golden (then of Silver Lake and later of Topeka), became a major league pitcher who played for the Los Angeles Dodgers and the Houston Colt .45's. Others on the team would make minor league rosters, including Galen Mote, Don Luttrell, Ford Arbogast, and Ted Worthington. Digital reproduction of the photograph and certificate was accomplished through a joint project sponsored by the Kansas Historical Society and the Shawnee County Baseball Hall of Fame.